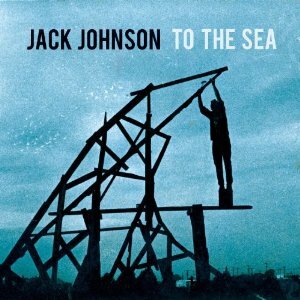 If you're familiar with Hawaiian singer/songwriter Jack Johnson's music, the first thing that will probably strike you about his new album, To The Sea, is the presence of electric guitars throughout it. While not as significant as say, Dylan plugging in at Newport, it’s just not quite what we’ve come to expect from the laid back musician. Don’t get me wrong, his casually strummed acoustic, relaxed vocals and barefooted vibe are all still present. For me, there’s just the slightest hiccup every time a jangly electric chord hits or a distorted solo kick in. It’s not enough to jar you out of the effects of Jack’s patented chill out powers, but it’s just enough to nudge the mental hammock he so masterfully creates. 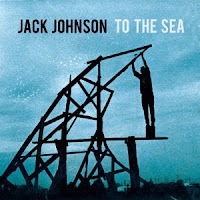 After five acoustic-driven albums under his belt, Jack has decided to step out just a little bit with the instrumentation and vibe on To The Sea. It’s definitely enough to keep things interesting without trying to reinvent the musical wheel. "You And Your Heart" kicks off the album with a duel acoustic/electric riff and Jack's voice setting the sun-soaked stage for the upbeat summer jam it turns into. Next is the title track and this is where Jack really starts introducing the electric guitars into the mix. The song opens with some clean, chorus-effected guitar and closes with a cool, cranked-up guitar solo. By the time "At Or With Me" kicks in, he's no longer worried about trying to ease the transition any longer and really uses the electric to mimic the vocal and propel the song forward to a different level than he usually hits. There's also another great guitar solo on this one too. For every new direction though, there's enough songs that remain in his wheelhouse to please long-time fans. Songs like "Red Wine, Mistakes, Mythology" and "No Good With Faces" would've fit in nicely on any of his other albums. He even adds some nice recorded outdoor nature sounds to "When I Look Up" just to remind you that this lifetime surfer is still more at home on the beach than on stage. It's always nice to see an artist take chances and risks in an attempt to stretch their creativity and levels of comfort. It's also nice when in cases like this, it pays off for them. To The Sea hits stores this Tuesday, June 1st.